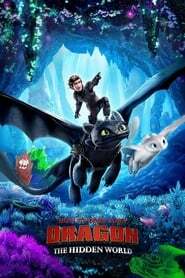 How to Train Your Dragon: The Hidden World is a 2019 Animation Family Adventure movie directed by . It stars Jay Baruchel, America Ferrera, F. Murray Abraham, among others. How to Train Your Dragon: The Hidden World is currently rated 7.6 stars on the ReelBugs scale. "The friendship of a lifetime"
Hiccup : " You're right bud, it's time." Song : "To fly on your own." This series helped me train my dragon! I love my nightfury!!! I'm gonna cry at the end of the Movie! Disney usually dominates my animated movie viewing, and for good reason. But every now and then, Dreamworks comes up with their own idea that eclipses most of what even Disney/Pixar put out. The HTTYD series has been up there with Prince of Egypt as movies that stand against Disney's best, and I have high hopes for this one, too. The song choices for these last two trailers have been amazing. And the way they remade the underscores to sound like the HTTYD OST is absolutely beautiful! This is why I love you How To Train Your Dragon! Attention to detail. So much love and care put into making these movies. Family friendly, while not being too childish for adults to enjoy. Lighthearted while still being an epic story! Funny while still giving you the feels... I’m not sure I’m ready to see this movie. I’m gonna miss you HTTYD. I hope the songs in the trailer are on the film's soundtrack!!!! I'm guessing Grimmel is the alternate version of Hiccup if Hiccup killed Toothless instead of taming him. im crying.literally. my heart exploded. how beautiful. 2:18 The Light Fury is laughing! Not only Dreamworks' arguably best franchise, but one of the best animated sagas of all time. Thank you Dreamworks for gifting me with this beloved masterclass of a stories. One question tho........what exactly are their dragon riding suits made from? 2:03 Is That Drago’s Bewilderbeast And 2 Light Furies?